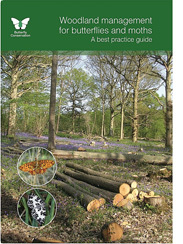 Woodland management for butterflies and moths: a best practice guide. This guide is intended for anyone involved in the management of woodland. It provides guidance on the woodland habitat features needed by butterflies and moths, and how to create, maintain and improve them. It draws on thirty years of experience and research in to management of woodlands by Butterfly Conservation staff, volunteers and other experts. Woodland habitats support two-thirds of British butterfly species and 16 of them rely on woodland in all or part of their range. In addition over 500 moth species are associated with woodlands. Butterflies and moths are known to be valuable indicator species of and recent studies suggest that a large number of species are in rapid decline. In woodland habitats butterfly abundance has more than halved since 1990 when detailed recording began.